You are in the renewable energy business in the United States, and receive a notice about an upcoming conference on the topic to be held in Brazil. You’re interested, and start thinking about next steps. However, after talking with some colleagues at the office, you are quickly reminded that Brazil is in an economic slump, its politics more volatile than usual. “Slump” and “volatile” are not samba to your ears, and you decide that this isn’t the year to expand to Brazil. Country Commercial Guides showcase market research intelligence for 120+ countries. You’ve made a mistake. There’s significant opportunity in the renewable energy market. What should you have done to get an accurate understanding of the market, even if you decide not to go to a trade show for the industry? Well, you should have consulted a resource that for many years has been providing reliable, in-depth market research for U.S. companies of all sizes. The publication is called the Country Commercial Guide (CCG) and there are Guides covering some 123 markets. Formerly comprised of large, door stop proportions, the CCGs from 2015 are divided into bite size bits and accessible online via export.gov/ccg/. In case we fail to mention it later, access is FREE. It’s never a good idea to select market opportunities based on faulty assumptions and hearsay. With the CCG’s, you can get accurate, bankable information with an investment of a few minutes and a couple of mouse clicks. The format is mobile friendly, so you can peruse tidbits at your leisure, emailing yourself, or colleagues, to select pages for closer scrutiny later. Your boss may appreciate receiving this information for its brevity and insightfulness. One of the first and most important things you notice is that despite a bumpy economy, caused in part by China’s falling demand for natural resources, Brazil is eager to build up its alternative energy capabilities. A drought in part of the country means that dependence on hydro power must be balanced with more solar and wind power. Businesses in the U.S. specializing in renewable energy should take note: Brazil isn’t your only best bet, and there’s opportunity in the most unlikely places—if you know where to look for it, like the Country Commercial Guide’s best prospect report on Renewable Energy. A good place to look for buyers is trade shows, and Brazil has many, including in the energy sector. Trade shows inevitably provide a solution to one of businesses biggest challenges: Where to find buyers—and these shows have a big collection of them under one large roof. Some of these shows will be attended by market and sector experts of the U.S. Commercial Service, based at the U.S. embassy and consulates. These folks know the buyers and will guide you to them, making sure reputations are impeccable and that they have the money and are ready to spend it. In turn the buyers may trust you more because the U.S. government is introducing you. Now that you’ve changed you mind about attending a trade show in Brazil, you wonder about temporary entry for samples or a popup table display. There’s a section in the CCG on temporary imports. To your surprise, you learn that in this heavily taxed country, temporary imports are also taxed, but the amount is pro-rated based on the amount of time the goods are in the country. You can calculate the cost ahead of time. You learn that Brazil is examining the Carnet system, whereby participating countries agree not to tax temporary imports and a common document is used to expedite Customs processing. You make a note to check back in six months to see if Brazil has joined the Carnet system. If you make more frequent trips to Brazil, the Carnet, if adopted, will be useful. 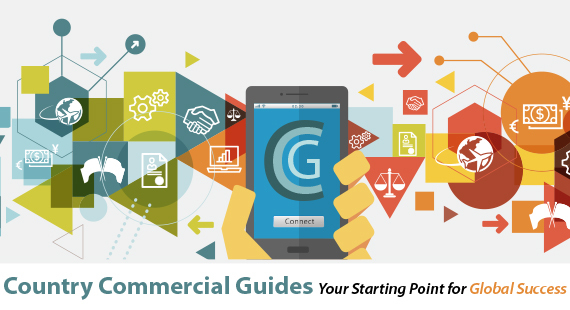 Certain business protocols such as dress, perceptions of time, negotiation strategies, and trust are also covered in the CCG and can make the difference between making a sale and losing one. It’s not an overstatement to say that in no other publication, on or offline, can you find this mix of hard data and practical business acumen that you can apply immediately. Oh, and did we mention that it’s FREE?